Jussie Smollett sat down with Robin Roberts on Good Morning America for his first interview since the racist and homophobic attack against him in Chicago last month. 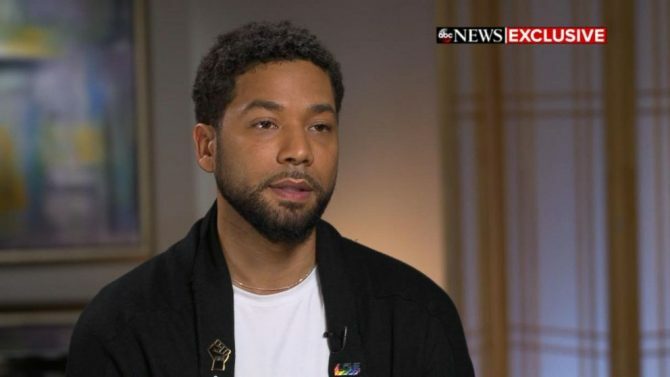 In the interview, which aired this morning, Smollett tells Roberts he’s “pissed off” about all the misinformation that’s been circulating since the January 29 assault, as well as at the people who refuse to believe him. He continues: “For me, the main thing was the idea that I somehow switched up my story, you know? And that somehow maybe I added a little extra trinket, you know, of the MAGA thing. I stand with Jussie. When I first heard about this I was so angry…how could this happen in modern day America? Smh. Breaks my heart. Note I would feel the same if it happened to anyone. How can anyone have so much hate in their heart to do this to another human being. As a community we should all be angry and scared because if this happened to a celebrity how often does it happen to real people and it’s never reported? Crazy. This is crazy. If you look at Robin’s body language and facial features its clear she too does not believe him. You went to Walgreens FIRST while knowing the Subway shop was still open looking for food? Okaaaaaayyyyyyy! Considering the last “persons of interest” the police publicized ended up being 2 homeless guys who were seen leaving the area of the claimed attack 15 to 30 minutes before it happened, I wouldn’t attach a lot of meaning to this. As a rule of thumb, it’s a good idea to disregard anyone who says or writes “I stand with . . .” It’s a sure sign that they are not interested in making a rational argument or presenting evidence. They are just beating their chest and proclaiming loyalty. I went to abcnews.go.com and saw the entire interview. I commend him for telling young gay men to learn to fight both physically and mentally. That was SOUND advice. As for the rest I think I’ve made my position quite clear. If you do decided to look at the interview in its entirety be sure to take note of the expression on Robin Roberts face and her body language and see what you conclude. The excerpt from this interview posted is only a snippet of what was said. He was in a fight, no doubt. Its the reason behind the fight is whats in question. The season cliffhanger where he was shot was schedule to be his last but sympathy from fans kept him on the show. That could be the case once again only this time he over did it. That gig he played the following weekend wasn’t exactly a sold out The Staples Center type crowd he played for and no critic has praised his singing or acting talents either. Given the cops have now identified and are apparently interrogating some people of interest, are you still spinning this as a fake event or will your spin change. The fact is that you have no clue whatsoever as to what happened. Instead, you are cherrypicking factoids to support an opinion you have had from the moment this story first broke. This is a classic example of confirmation bias, something you know well and indulge in often. I have no idea as to what happened that night and I have no opinion one way or another on it. I am quite content to wait until the cops finish their investigation. You have already bought the rope, picked out the tree, and sent out invitations to a lynching. Bob I don’t think he ever meant for this to get so blown out of proportion. However It worked though. Most people didn’t know who Jussie Smollett even was until now. Ok, is it safe to assume that you want to be left off of the VIP’s that surely I’m going to invite? Thats gratitude for you. And to think I had you seated between ol’ Giancarlo and Mo’ Bro. They’ll be so disappointed but hey, if you don’t want to come then I’ll just have to accept that and move on. At this point, the conspiracy theorists are the ones that still believe Jussie. You have to take a lot of leaps in logic and ignore several laws of physics to believe the story he’s telling. Literally every detail and piece of evidence that has come out points to him lying. When it turns out that this was a hoax, will you issue me and others an apology? If the bottle was kept near the attackers body it would pour. Think about it; does a freshly filled ice cube tray freeze instantly when put the freezer? If it takes ribs years to heal see a Dr. that ain’t right. Yeah, I absolutely believe Jussie is lying, but it sure isn’t because the bleach wasn’t frozen. I’m shocked that so many people seem to think it would instantly freeze the second it got to the freezing point temperature. Ok Queerty, you were and are part of the problem. There were NO MAGA hats. But in your eagerness to stick it to Trump and his ilk, you went with that rumor (aka fake news). One bit of food for thought – If there wasn’t something “off” with this story, would he not have turned over his phone right away for any sort of examination even if he didn’t think it would help his case? Was this just a hook up gone bad? I would like for just one person who believes Jussie to explain how there is zero video footage of the attackers, while Jussie’s entire trip other than 60 seconds is documented. How would 2 people completely avoid every camera in the neighborhood when Jussie clearly couldn’t avoid them? Anyone? Show a coverage map, and w will go from there. You have seen a map that the cameras’ cover right? Doesn’t matter. For them to attack him, they obviously had to be in the same physical location as him. If he is on video, they would be too. How would they not be? An escape route that isn’t covered by cctv is the 1st thing that comes to mind. That is why I want to see a diagram; I really hoped you had seen one to be honest. You think these were criminal masterminds that were able to figure out the location of every security camera in the area and were able to converge on, and escape from the same location Jussie was, while his every step to and from the location was caught on camera? That really seems rational to you? More rational than Jussie ducking into an alley or something similarly out if the way and putting the rope around his neck, which would explain why there is only a single minute unaccounted for? Read or watch Jussie’s description of the attack today. He says he was punched in the face and kicked in the back and that he fought back. You really, REALLY think that would have all happened, and that he picked himself up, composed himself, and started again on his way in 60 seconds? That also makes sense to you? God help any prosecutor who ends up with you on a jury. I’d like to know how he kept hold of his phone and sub through the attack. He goes off camera then back into view with sub and phone in hand. It would also be good to hear why he’s unwilling to provide phone records. Remember, this all had to happen within 60 seconds too. Someone on Reddit made a good point about how the timeline does not jibe with his story. He said he did not initially want to report the crime and only did so after a friend persuaded him to report it. But when the police showed up, he was wearing the rope around his neck. He said he left the rope around his neck in order to preserve the evidence. But if he initially had no intention of reporting the crime, why didn’t he take the rope off immediately? Ooh, that hasn’t occurred to me but it’s right. It still won’t persuade the people who are still doing mental gymnastics to defend him, yet are never actually able to refute any of the logical points we are making as to why it obviously didn’t happen. obj assumes facts not in evidence. Maybe he didn’t really notice it till his friend pointed it out. Then decided to leave it in place. Wrong. He already has said that he deliberately left it on, plus he addressed it in today’s interview. Multiple sources now confirming that the “attack” was staged because he was allegedly being written out of the show. I mean it was pretty clear that something was off about this whole story, but even I was holding out a slim hope that there was some explanation because its such a slap in the face to real victims of hate crimes based on sexuality and/or race. I’m so disappointed and hurt and angry with him because I really liked him as an actor and seemed like a really nice guy, but this is damn near unforgivable. His career? DONE!! I mean how do you recover from this. Legally, he should be charged with something. The Robin Roberts interview makes it look even worse. I can’t wait to see how Queerty spins this. You know they’re never going to admit they were wrong in the way they covered the story. They’ll turn him into a new victim, the only mystery is victim of what? Chicago Police now disputing reports that they believe the story is a hoax. You know what…I’m just gonna shut up and wait until there is a confession or irrefutable evidence that explains exactly what happened. I’ve grown tired. I read both reports as well. The reports that it’s a hoax are coming from internal sources within the Chicago PD but I assume since its still an active investigation and they haven’t definitively proven its a hoax, the police had to issue a statement. However, I think it’s safe to say that this is going to turn into a hoax investigation before next week. Strange that Jussie said his attackers were white men yelling “MAGA country” in downtown Chicago when they were actually Nigerians, one of which worked with him on Empire. Plus Queerty’s “BuT wHaT wOuLd Be ThE MoTiVe? ?” shows they can’t see the motive. He was being written off the show and his music career tanked so there would be nothing left for Jussie. Making up a fake hate crime to further divide the nation would get him victim points and make FOX put him back on the show and sell out his music gigs (which it did). The police refusing to confirm it is just a formality. This story would not have run if there weren’t concrete sources leaking the info. It will be official within a day or two. Im going to wait until CPD finishes their investigation to render my opinion. i stated before that no one should ever touch another individual without consent. There’s just too many inconsistencies from Jussie and CPD to pass judgement. But i will say, if they find this out to be true, the thugs should be severely punished and do considerable jail time. If this is not true, then Mr. Smollett should be prosecuted fully that law allows for making a false report and he should reimburse the city and depts. for the man/women police, FBI, EMT, Hospital staff etc,for their professionalism. This is not a game Its just sad to hear such things going on these days with all the diversity and hate that is currently going on. Good Luck. Oh WAIT: The suspects are BLACK! Of Nigerian descent! It’s classic case of black on black homophobia! oh well, the news about “new turn in the investigation” was deleted fron Queerty? Why so? Now that we know he lied about the whole thing and even hired a defense attorney because he knows there will be charges against him for this horrible hoax, I’m disappointed and disgusted not only at him but the people who refused to see the evident truth and helped push his lies in order to promote hate and division in this country.